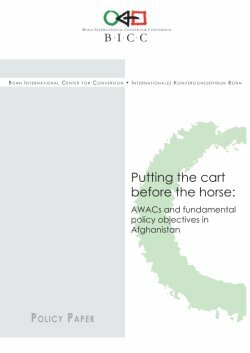 1.An assessment of the need for NATO AWACs deployment in Afghanistan. 2.The need to think about the framework within which the discussion about AWACs deployment can be carried out. In principle, our argument is that while the question of deploying AWACs is important, a prerequisite to answering this question is a clear Afghanistan strategy with derived concrete objectives. Without such a strategy, decisions about deploying AWACs or other German forces cannot be made sensibly.